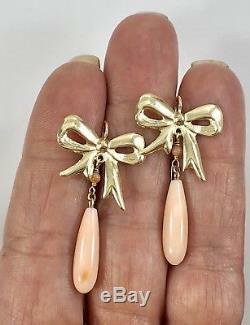 Angel Skin Coral & 14k Yellow Gold Bow Dangle/Drop Earrings, New. 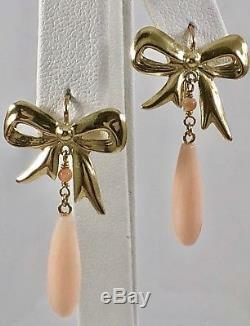 These feminine earrings feature 2 vintage, hand-carved untreated angel skin color coral drops (17mmx5mm) as well as 2.5mm beads (8ctw). 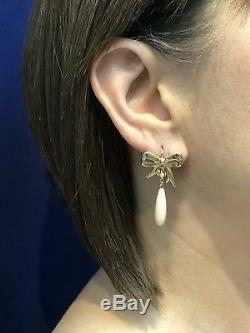 They have been carefully hand-crafted in our shop using solid 14kt yellow gold components. 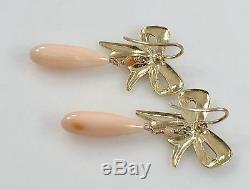 Including the hook, these earrings are 1.5" long, 0.78" wide, and together weigh 4.2 grams. The earrings have been acid tested solid 14k yellow gold. In person, they are slightly pinker and the color zoning in one area is more subtle. Please keep in mind that this item is also displayed at our physical location and should a customer ask for it, I will end the listing. If you like this unique item, don't hesitate. We try to offer fast and convenient service. 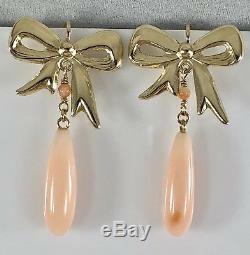 The item "Angel Skin Coral & 14k Yellow Gold Bow Dangle/Drop Earrings, New" is in sale since Thursday, April 12, 2018. This item is in the category "Jewelry & Watches\Fine Jewelry\Fine Earrings\Gemstone". The seller is "panamericangem1" and is located in Miami, Florida. This item can be shipped to United States, Canada, United Kingdom, Denmark, Romania, Slovakia, Bulgaria, Czech republic, Finland, Hungary, Latvia, Lithuania, Malta, Estonia, Australia, Greece, Portugal, Cyprus, Slovenia, Japan, Sweden, South Korea, Indonesia, Taiwan, Thailand, Belgium, France, Hong Kong, Ireland, Netherlands, Poland, Spain, Italy, Germany, Austria, Israel, Mexico, New Zealand, Philippines, Singapore, Norway, Saudi arabia, United arab emirates, Qatar, Kuwait, Bahrain, Croatia, Malaysia, Brazil, Chile, Colombia, Costa rica.